A heatmap is a literal way of visualizing a table of numbers, where you substitute the numbers with colored cells. This is a quick way to make one in R.
A heatmap is basically a table that has colors in place of numbers. Colors correspond to the level of the measurement. Each column can be a different metric like above, or it can be all the same like this one. It’s useful for finding highs and lows and sometimes, patterns. We’re going to use R for this. It’s a statistical computing language and environment, and it’s free. Get it for Windows, Mac, or Linux. It’s a simple one-click install for Windows and Mac. I’ve never tried Linux. Did you download and install R? Okay, let’s move on. Like all visualization, you should start with the data. No data? No visualization for you. For this tutorial, we’ll use NBA basketball statistics from last season that I downloaded from databaseBasketball. I’ve made it available here as a CSV file. You don’t have to download it though. R can do it for you. I’m assuming you started R already. You should see a blank window. Initial R window when you open it. Exciting, I know. Now we’ll load the data using read.csv(). We’ve read a CSV file from a URL and specified the field separator as a comma. The data is stored in nba. Type nba in the window, and you can see the data. The data is sorted by points per game, greatest to least. Let’s make it the other way around so that it’s least to greatest. We could just as easily chosen to order by assists, blocks, etc. As is, the column names match the CSV file’s header. That’s what we want. Are you noticing something here? It’s important to note that a lot of visualization involves gathering and preparing data. Rarely, do you get data exactly how you need it, so you should expect to do some data munging before the visuals. Anyways, moving on. The data was loaded into a data frame, but it has to be a data matrix to make your heatmap. The difference between a frame and a matrix is not important for this tutorial. You just need to know how to change it. For the heatmap at the beginning of this post, I used the RColorBrewer library. Really, you can choose any color scheme you want. The col argument accepts any vector of hexidecimal-coded colors. If you’re using the heatmap to simply see what your data looks like, you can probably stop. But if it’s for a report or presentation, you’ll probably want to clean it up. You can fuss around with the options in R or you can save the graphic as a PDF and then import it into your favorite illustration software. I personally use Adobe Illustrator, but you might prefer Inkscape, the open source (free) solution. Illustrator is kind of expensive, but you can probably find an old version on the cheap. I still use CS2. Adobe’s up to CS4 already. For the final basketball graphic, I used a blue color scheme from RColorBrewer and then lightened the blue shades, added white border, changed the font, and organized the labels in Illustrator. Voila. Rinse and repeat to use with your own data. Have fun heatmapping. For more on custom heat maps to visualize your data, check out the members-only tutorial. I keep meaning to start playing with R, but would rather do it in the browser if possible… do you know if the above works in the ggplot/online-R environment? i don’t think you can, but you can do it in the online ggplot implementation. i’d strong encourage trying it in R though :). It’s a simple installation and it’s free, so nothing to lose really. There’s an online environment for ggplot/R? Hi Tony, I’m working on Pretty Graph, which is a web-based graph application. It will help you make graphs like the above heatmaps very easily without writing any R code. If you are interested in trying it out, sign up at http://prettygraph.com or simply email me at [email protected]. Here’s another NBA related, schedule heat map of 2009-2010 regular season. You may find that the ‘heatmap.2’ function in the ‘gplots’ package has a number of useful extensions to the original ‘heatmap’ function. @tony hirst definitely doable in ggplot, but haven’t played with the online app enough to know whether it’ll work. geom_tile is what you’d want to use. I doubt Rcolorbrewer is available in online app. @nathan it would be interesting to see if some of the tidying up can be done in r, so as to make it easier to replicate with new data. I think ggplot would get you a lot of the way there with it’s layer functionality. @everheardofaspacebar – i’m almost certain you could tidy up in R, but since I work with Illustrator already, it fits better in my workflow. You may also want to do a correlation analysis on the attributes and then pick your favorite attribute (or one that loads heavily on the first principal component) then sort the columns that way. Sort the players by how they score on the first principal component to group them by some similarity. Open a csv matrix in Excel, select the data, and add on Conditional Formatting > Color Scales (this might only be in Office 2007 and on?). It’s also nice because you can view the underlying data by clicking on a given cell. Also, -plotmatrix- in stata makes pretty nice heatmaps. do you add the white borders in R or in Illustrator? What is the color encoding used by the R heatmap function? It doesn’t look like a simple linear encoding of the values for each column (because some columns don’t span the full gradient), nor is it a simple linear encoding of all values in the matrix (because then some columns would be nearly all white, because values for X3PP are much lower than MIN, for example). Based on the R documentation it looks like it normalizes each column (since you specified scale = “column”) to have a mean of zero and a standard deviation of one, and then it does a linear encoding of *those* values using the color gradient. So this visualizes standardized distance from the mean, rather than the “raw” underlying data. Which is nice, but a bit surprising. And I wonder how well it works if the data isn’t distributed normally. along with rollover values. very cool, mike. Mike, could you link the source for that as well? 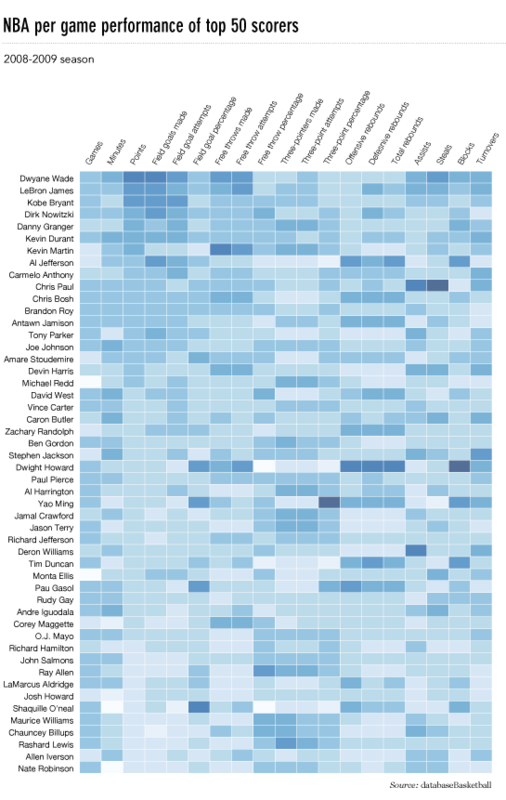 Would Protovis be able to handle large heatmaps (say 400×400)? Well, after playing around for a bit, I created the very large heatmap I was hoping for with protoviz. Very cool package! Does anyone have any suggestions on tools/methods that I could use to produce a high density heatmap with a 400×400 matrix? I’d like to produce a visualization of messages sent between individual users. I might be being a bit dense, but how do you load up the RColorBrewer library so that you can use it? I’ve downloaded the package onto my MacBook, but I don’t know how to install it so that the R Console can use it. You can install it from Packages and Data menu. That will download the package again from an online repository but is the easiest way to install any package. See this page for more details – http://cran.r-project.org/bin/macosx/RMacOSX-FAQ.html#Installation-of-packages. Thanks both. That worked a treat. =) Great tutorial, Nathan, thanks! Just one more thing, though (isn’t there always? )… Is there a way to get it to color the heatmap not as if the data is scaled differently by column, but with the same scale overall? Say, for example, rather than measuring all different statistics for all the above players, you were measuring their points per game, but for different games. I’ve already got the dataset I want in: I just can’t figure out how to stop it coloring them column by column. You know what, I just figured it. Kind of obvious, wasn’t it? Ah, well. I’m new to R.
Hey Nathan, very nice tutorial. I was able to create a heatmap of some collision data I have been muddling through…in about 3 minutes! Now I finally have an incentive to hone my R skills and have fun doing so. Thanks! Very cool I’d love to see the same in Python with numpy/matpotlib/gnuplot? or something similar?? But this may make me have to fiddle some with R but I’d sure like to stick with Python,,, My brain is too small and slow for many more systems/languages. the good thing about picking up R though is that you get a lot of bang for the buck because there are so many packages that do most of the work. The hard part is finding the packages. Of course learning R etc. is highly recommended regardless. I uploaded the RColorBrewer, but I can’t figure out how to create the heat map using anything other than the standard color schemes: heat.colors(n), terrain.colors(n), topo.colors(n), and cm.colors(n). Then try loading the package again. If you type just that in w/o the heatmap(…), you’ll see that it’s an array of 9 shades of blue. The technique I’ve used successfully for heat map visualization of 2D data which doesn’t easily/obviously translate into a heat map (e.g. random 2D samples where each dimension is ordered) is to generate a 2D histogram with bin sizes representing the “resolution” of the heat map, then use the 2D histogram peaks either in a contour map or a heat map. This works well in Matlab and translates well into any system where it is easy to generate 2D histograms and contour or heat maps from an MxN matrix of values. Ian, I am having a hard time visualizing this but it sounds intriguing. Could you possibly point me to an example? This is a great tutorial and something that I just passed along to my team at Three Deep. Thanks to everyone for making it so easy to follow and providing sample code! 1) Browse the available color and change the color of my heatmap? I’ve downloaded the RColorBrewer and I opened the blue package from the above instruction. But I have no idea how to put them into the heatmap. 2) I had problems sorting my data. I want it to go alphabetically from A to Z (which was my original csv) but somehow the order become Z to A in the heatmap. I rectified this problem by opening it in Excel and change the sorting…but clearly this isn’t really appropriate. 3) Apply the border and change the text using Inkscape. Thanks for the post- great stuff and sorry for taking your time. This is a great resource. I started using R yesterday and was able to generate a heatmap using my own data a few minutes later, so thanks. Error: unexpected input in "histo_heatmap <- heatmap(histo_matrix, Rowv=NA, Colv=NA, col = brewer.pal(9, ‚"
Any thoughts? Did something in the brewer package change so that that command is no longer valid? @Hrishi: Can’t wait for the heat map feature on your site! The relatively new and lesser known time series visualization can be useful if you know what you’re looking at, and they take up a lot less space.